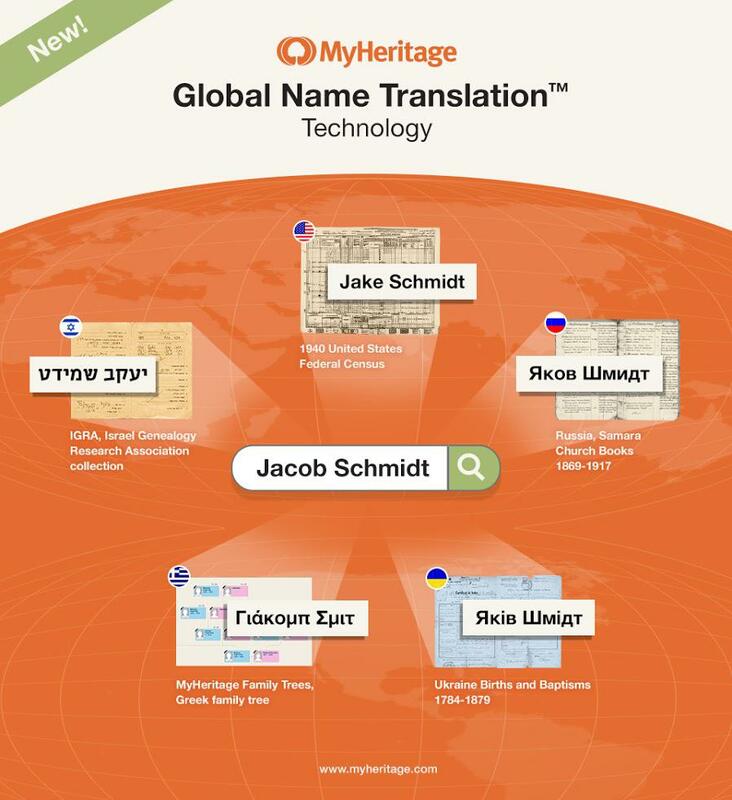 We’re delighted to announce the launch of Global Name Translation™, a new technology unique to MyHeritage, to help break through those language barriers in the quest to uncover your past. This innovation now makes it even easier to discover your global roots. The technology automatically translates names found in historical records and family trees from one language into another, at very high accuracy, generating all plausible translations, to facilitate matches between names in different languages. In addition, a manual search on MyHeritage’s SuperSearch, will return results in other languages, automatically translated into the language of the query. How can this benefit you? For example, perhaps your American family has Russian roots. Previously, you would have needed to search also in Russian to find all information available about your ancestors. Now you can search in English, and receive results in Russian, translated back into English for your convenience. The technology covers given names and surnames and can tackle names previously encountered in the past, in addition to new names not seen before. It also utilizes extensive dictionaries built by MyHeritage to cover synonyms and nicknames. 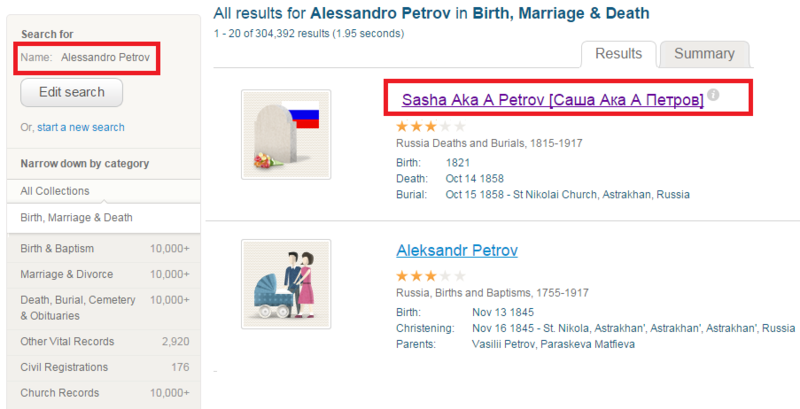 For example, a search for Alessandro (Alexander in Italian) will also find “Саша” (Russian form of Sasha, a popular nickname for Alexander) with its corresponding translation into the language of your search. Global Name Translation™ is built on advanced algorithms and based on MyHeritage’s massive multilingual and international database of 6 billion family tree profiles and historical records. The technology is also integrated into our matching technologies, so you’ll begin receiving matches, with very high accuracy, translated on your behalf. 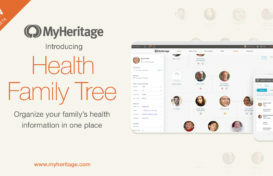 If a user from Greece, with family tree data entered in Greek, is related to a user in Israel with family tree data entered in Hebrew, MyHeritage will be able to connect them by matching the names in both languages, and show the two users how their family trees overlap, leading to exciting family reunions as never before. 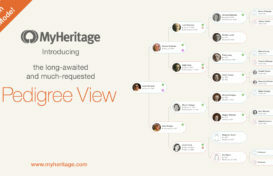 Anyone with a family tree at MyHeritage can use our new Global Name Translation™ technology. Begin by enjoying automatic matches or use SuperSearch, our online database of billions of historical records, to find your ancestors from around the world. Our first version successfully translates names among English, German, Dutch, French, Spanish, Catalan, Portuguese, Italian, Norwegian, Swedish, Danish, Greek, Hebrew, Polish, Czech, Russian and Ukrainian. The next version, currently in development, will add Chinese and Japanese, and additional languages will follow. Although the world is becoming smaller and more connected, information from various countries is still hidden from those who don’t understand those languages. Now, we’ve made it easier for users around the world to research and discover their global roots by removing the obstacle of translating names from one language to another. We’re proud to have pioneered this tool as part of our mission to develop the best technologies for facilitating family history discoveries for everyone, everywhere. Information is doubling and tripling as time goeson. Great job guys – any chance this would work in tree viewer and not just in search? Hopefully, the Super Search will include Hungarian! I have made more progress using Myheritage than any other. Great, maybe It will help me find Polish/Russian records. I think this is wonderful. It will increase knowledge for all. My husband is of German descent on both of his parents. This will make it faster finding information. Mazel tov!! This is VERY helpful! When my French ancestors went to Uruguay all of their names were changes into Spanish. This will be a great help. I want more information. This is exciting. Can you help me with my maiden name and married name please.? This is wonderful and will keep alive the enthusiasm of many who maybe would have given up. Irish would be nice as so many Aussies relate back to Ireland. Tagalog and Cebuano would be good, countless Filipinos work abroad. I am amazed. Thank you for making things faster and easier. I wonder if this technology also covers some Asian languages,- for example URDU spoken and understood by majority in sub continent ( India , Pakistan and neighbouring countries ?? I want to try it too. For a long time I wanted to know about my ancestors. I hope to get success from this. I am hoping that this new addotion to My Heritage will be able to help multitudes of people! The Czech language is already assisting me with my Slovak paternal family tree. I now have a rather comprehensive family tree which is still growing. Can Slovak be one of the next languages after Chinese and Japanese? my grandfather, Dope Harrison, full blood Cherokee. American name was Benjamin Harrison. recorded in the archives. would love to know my complete heritage. thank you so much for your assistance. thanks a lot. it is an better inspiration. Interested to see how this develops with regards Irish surnames which go through many level of corruption from their Gaelic origins. Many in the USA have their Irish roots obscured by ancestors using overtly anglicized spellings to avoid nativist prejudices for example. I am looking forward to this program. I find easy to use the “My Heritage” program. I am looking forward to this program.Even I don’t have difficulties to read Latin or Russian letters. But I don’ always recognize that the name I find is same that I already have on the tree. Its really a good blog on English to Marathi dictionary tips. I appreciate your article. Thanks for the information about learn English to Marathi clearly. This blog is really helpful to give a light in this issue. So thanks for sharing all that important information.